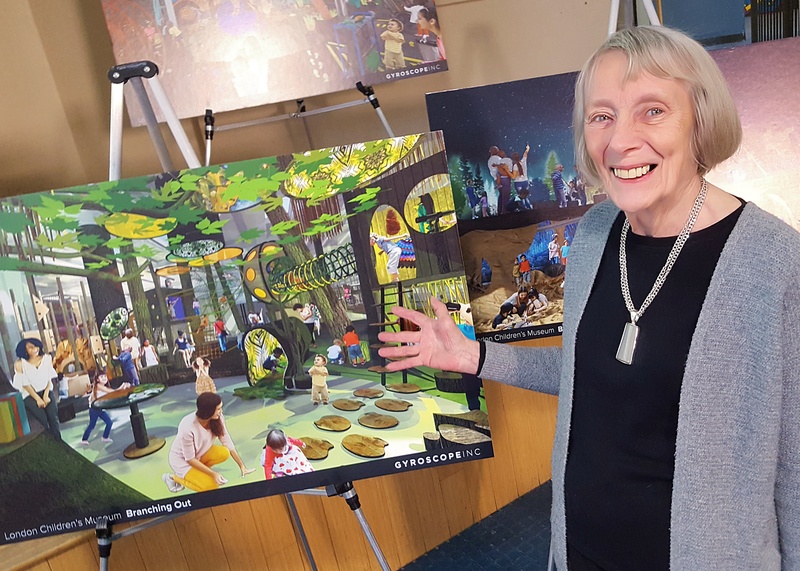 Four conceptual renderings were released Dec. 14, providing Londoners — including founder Carol Johnston — with a first look inside the future London Children’s Museum. Carol Johnston founded Canada’s first children’s museum in 1975 with the intention of providing the community — and kids in particular — with a cultural and educational resource that fostered the development of young minds. Work has been underway for several months as London Children’s Museum prepares to move into to a new home at 100 Kellogg Lane. On Dec. 14, Johnston and a group of staff members, community stakeholders and supporters were given a first look at what the Children’s Museum is becoming when four conceptual renderings were released by design firm Gyroscope Inc. The master plan is the result of input from hundreds of children, families, educators and community members, and according to Johnston provides the overall vision for a re-imagined Children’s Museum. The new Children’s Museum will feature eight zones offering immersive and interactive play experiences. From a network of treehouses and animal habitats to a mini streetscape, children will have the opportunity to flex their imaginations and indulge their curiosity. A stream to play in, underground caves to explore, farming and planting, digging for gems, and a space for making and tinkering are just some of the experiences the new Children’s Museum will offer. Completion of the Children’s Museum master plan will now be followed by architectural planning, exhibit design and custom exhibit fabrication. This process is expected to take three years. The re-imagined Children’s Museum is expected to be completed by 2021 at a cost of $14 million. Tasha Leverette, Chief Action Officer at Gyroscope Inc., said she was happy with the public’s reactions to the vision presented in the master plan. Johnston said people have been asking her about the future of the Children’s Museum since the move to 100 Kellogg Lane was announced in May 2018. They’re “impatient for it to happen, we all are,” Johnston said, adding the sentiment she heard at the public unveiling was all extremely positive. Until renovation is complete at 100 Kellogg Lane, the Children’s Museum will remain open at 21 Wharncliffe Rd. S. The community can stay up-to-date on the new Children’s Museum at staycuriouslondon.ca. A treehouse village in a forest full of dancing light and wildlife hideaways. A space to unleash STEAM-based creativity through building, tinkering, hacking and inventing. A journey from underground to overheard transports visitors into London’s ancient past, the night sky and a world where dreams come to life. A farm and factory encourage planting, digging and harvesting, and tell the story of the region’s agriculture and industry. An event to mark the 100th anniversary of Canadian women receiving the right to vote in a federal election will be held Saturday, May 26. On May 24, 1918, Canadian women received the right to vote in federal elections for the first time, a historic moment Londoners are going to recognize with an event wrapping up at Eldon House. Century for Women: Votes, Voices and Choices, which will mark the 100th anniversary of this landmark moment in the nation’s history, is set for Saturday, May 26. The celebration will include a march from the Normal School on Elmwood Avenue to Eldon House Heritage Site and Gardens. The march will be followed by speakers, music and refreshments at Eldon House on the grounds. The march will begin at 11a.m. and proceed to The Covent Garden Market Square and then to Eldon House. The march and the event that follows, which are free and open to the general public, was planned months ago by a community committee led by author and women’s rights activist Dr. Jean Hewitt, and Eldon House program co-ordinator Danielle Costello. This celebration of the 100th anniversary of the vote is part of a series of events organized by the committee and held in London during 2018 to mark the progress women have made and discuss what is left to do. When Sir Robert Borden and his government promoted the idea of giving women over 21 the vote, two groups of women were left out — Asian women didn’t get the vote until 1947 and Indigenous women had to wait until 1960. For more information, contact Danielle Costello at Eldon House, 519-661-5169, or by email at costello@eldonhouse.ca. The London Clean & Green organizing committee (from left: Rick Vandersluis, Erin Helm, Ron Scarfone, Carmela Ianni, Colleen Watson, Jay Stanford, Shannon Byron and Aashima Verma) have wrapped up another 12 Days of Cleaning, but remain committed to spreading their message of environmental awareness and action. The London Clean & Green kicked off its 23rd year back on April 10 with comments from several people, including yours truly. I was flattered to be asked to speak at the launch and bring my perspective to an event I have been covering for most of the 16 years I’ve been in the Forest City. The London Clean & Green has grown far beyond what even the organizers originally imagined. What was once a Saturday morning event has expanded to include the 12 Days of Cleaning and signature events such as the 20-Minute Makeover corporate challenge and the annual tree plantings in St. Julien Park on Earth Day. In my comments that day I spoke about being among the first reporters in the city to really get behind London Clean & Green, not only covering launch events and photo ops, but telling stories about those who were willing to stand up and do their part for a truly cleaner and hopefully greener city. “People respond to stories; people respond to stories of their fellow Londoners getting involved, caring and taking action on that caring not just standing around saying let’s do something,” I said that day, adding that Londoners care enough to get out every spring for more than two decades and clean up their city. With that in mind I was given the opportunity this year to continue telling those stories while sharing them on my Newswriter22 blog. There were plenty of stories to tell. Jay Stanford, London Clean & Green committee member and the City of London’s director of environment, fleet and solid waste, addressed the litter problem from the view of the municipality. That effort was reflected through many conversations I had the pleasure of sharing over the past couple weeks. Nadine Reeves, communications and marketing co-ordinator at Childreach, spoke about how her organization’s ongoing participation in the 20-Minute Makeover helped not only clean up their property, but connect with their neighbours while inspiring the children they care for to be environmentally minded. Nicole St. John, herself a former London Clean & Green committee member and a long-time community cleanup participant, expressed why she continues to be involved in the project. Not only is she out there picking up garbage during the Community Cleanup Day, but she is also out there throughout the year, doing her part to pick up litter. That effort continued this year and all it takes is a quick jump on social media to see the progress. The London Clean & Green brought in Fanshawe College students Colleen Watson and Aashima Verma to push the organization’s message out across the internet. If you want proof Londoners embraced that call, visit Facebook, Twitter and Instagram and search for the hashtags #519CleanGreen and #20MinuteMakeover and you’ll see all the proof you need. As the cleanup portion of London’s environmental efforts comes to a close, concentration has shifted to the greening. May is the time for events such as tree plantings, compost sales, plant exchanges, nature walks and more. For more details of how you can continue to create a cleaner and greener city, visit the London Environmental Network at www.londonenvironment.net. More than 75 people turned out for the London Hydro community cleanup effort, joining thousands of Londoners who took part in the London Clean & Green Community Cleanup Day on April 21. Mother Nature decided to cut Londoners a break as the seemingly endless winter broke in time for the London Clean & Green’s annual Community Cleanup Day. The cleanup, the 23rd edition of which took place April 21, saw Londoners fan out across the Forest City, cleaning up neighbourhoods, local parks and waterways. They also got into the spirit of the day, sharing photos from dozens of community cleanup locations using the #519CleanGreen. One such cleanup saw more than 75 employees and family members from London Hydro get involved for the fifth year. The participants broke up into groups to clean up around the utility property, as well as in Thames and Carfrae parks and along the Thames River up to the Horton Street bridge. After five years of community cleanup efforts, London Hydro environmental supervisor Tom Arnos said he’s thrilled by how the staff has come together to make a difference in the London Clean & Green’s efforts. That said, he’s still concerned about just how much garbage ends up on the ground every spring. London Hydro director of operations Allan Van Damme was quick to add corporations need to be as mindful as their employees. After all, he adds, employees are always looking for ways the company can be more sustainable. Katrina Reinhart, a London Hydro corporate communications assistant, said the cleanup day is “a great thing” for not only the wider community, but her fellow employees too. After all, it’s a positive event that can also be used to bring together staff and their families in support of an important cause. If the London Hydro cleanup is closer to a party than a volunteer effort, then it makes sense prizes are awarded as well. Cleanup participants are given prizes for the most trash collected, the “dirtiest” participant, but also for the strangest items collected. Arnos said their efforts have often seen everything from bicycles to Hoover vacuums collected. For Reinhart, the all-time prize for strangest piece of garbage probably goes to an item picked up during London Hydro’s first cleanup, five year ago. Long-time Community Cleanup Day participant and former London Clean & Green committee member Nicole St. John will once again be joining thousands of Londoners picking up trash across the city on Saturday, April 21. Nicole St. John has taken part in London Clean & Green for nearly a decade now, not only because she wants to pick up litter in her Riverforks neighbourhood, but because she wants to help set an example. St. John, a former London Clean & Green committee member, is looking forward to taking part in her ninth community cleanup day on Saturday, April 21. She’s also hoping the organization’s overall message will become further entrenched because of her frustration around some people’s idea that it’s OK to litter because someone else will be along to pick up after them. This year marks the 23rd London Clean & Green Community Cleanup Day, which is designed to get Londoners out into their neighbourhoods between 9 a.m. and noon, picking up litter, removing graffiti and planting trees. Pastor Graham Buchanan from West London Alliance Church is another longtime community cleanup day participant. The church congregation has been taking part in the cleanup for the past six years because the Beaverbrook and Wonderland area where they are what he calls a high-traffic area when it comes to litter. The first few years, Buchanan recalls — somewhat jokingly — participants were “pulling chunks of cars out of the bushes,” trash that seemingly hadn’t been touched in decades. That said, litter in its many forms remains a problem Buchanan said the community has to take a stand against. And that goes not just for people’s individual properties. It also makes sense, Buchanan adds, for him to get young people involved in the cleanup. For example, he’s bringing his 10-year-old son out to the community cleanup because he sees it as important to model good behavior to today’s younger generation — an age group he believes is eager to get involved in creating change. For St. John, the environment is “extremely important on so many levels,” and London Clean & Green is an easy way to spend a couple hours, connect with neighbours, and take pride in cleaning up the community. It’s also a good way, she adds, to deal with that “lazy trash attitude,” that someone else will fix the problem.